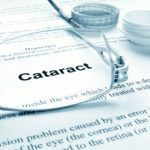 Recent advances in refractive surgery are designed to permanently reduce or eliminate the need for corrective eyewear to see objects clearly. Today, more than 3 million corneal refractive procedures are performed worldwide each year. Presently, more than 100 million patients wear contact lenses for correction of their refractive errors. 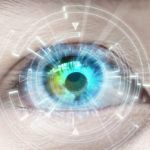 To better understand refractive surgeries, one should understand how a perfectly normal eye (20/20) focuses light and what are different types of refractive errors? 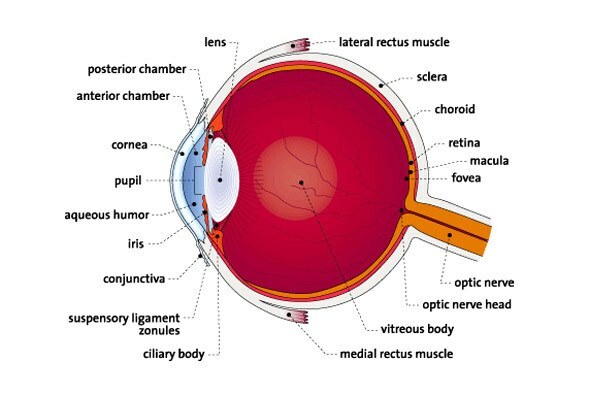 Let us first understand the main components of the eye. The cornea is the transparent front wall of the eye. 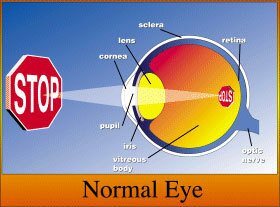 The cornea is one of the most critical components of the eye and is the “window” of your eye, just like the anterior window of your camera. Cornea works to refract light rays from the object viewed so that they focus on the retina at the back of your eye. Refractive errors occur when the cornea fails to focus light rays precisely on the retina. The cornea is the tissue which is reshaped during laser surgery. The iris is the colored portion of the eye. It is similar to the aperture of a camera. The iris regulates the amount of light entering the eye. The adjustable opening at the center of the iris that allows varying amounts of light to enter the eye. Dilation drops used by your eye doctor increase the size of the pupil so that the internal health of your eye can be evaluated. The lens focuses the light entering through the pupil, directing it to the retina. The curvature of the lens adjusts to focus at different distances. The optic nerve is similar to the cable that connects your video camera to the VCR. The image seen in the eye is transported to the brain where the image is processed. The optic nerve head is the portion of the optic nerve that is seen by an experienced eye care professional to evaluate for eye diseases such as glaucoma, papilledema (increase pressure in the brain), and optic neuritis. It is a nerve layer at the back of your eye that senses light and sends images to your brain. The retina is similar to the film in a camera. This is where the picture seen by the eye is converted to electrical signals and then transported to the brain via the optic nerve. The retina is made of cells called rods and cones. Rods are primarily used to aid with night and peripheral vision, while cones are designed to aid with color vision and crisp 20/20 vision. The macula is a small area located at the posterior portion of the retina. It is comprised of cones and functions in crisp 20/20 vision. Diseases that affect this area can cause a decrease in vision. Disease processes such as macular degeneration, retinal detachments, diabetes, and hypertension can potentially cause blindness. The sclera is the white portion of the eye. It is comprised of tough connective tissue that gives the eye its shape. It is a very thin layer covering the sclera. This layer carries blood vessels and very importantly it contributes to the innermost layer of a healthy tear film. Conditions affecting this layer such as surgery, infection etc. can affect your tear film. Ocular muscle alignment is critical in developing sharp three-dimensional vision. During a routine eye exam, an eye care professional evaluates the integrity of the muscles and the nerves which supply them. Muscle imbalance can cause lazy eye if it is not corrected during childhood. 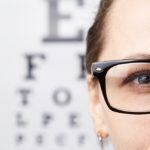 If a person can see objects nearby with no problem, but reading road signs or making out the writing on a billboard is more difficult, he may be near-sighted. Myopia occurs when light rays are focused in front of the retina, causing distant images to appear blurry. Far-objects appear blurry because the light rays are spread apart instead of focused when they strike the retina. Myopia is the result of an eyeball which is too long or a cornea which is too curved. Myopia is not a disease, nor does it mean that you have “bad eyes.” It simply refers to a variation in the shape of your eyeball. Myopia usually starts in childhood and gets progressively worse through adolescence. It usually stops changing by the late teens, but it can sometimes continue to get worse into the mid-twenties. Corrective concave lenses (“negative” lenses that are thicker at the edge than in the center) or contact lenses are prescribed to focus light more precisely on the retina, where a clear image is formed. Hyperopia, or farsightedness, is the opposite of myopia. 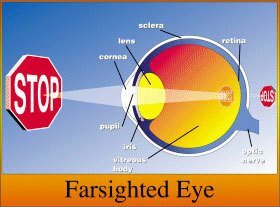 If a person can see objects at a distance clearly but has trouble focusing well on objects close up, he may be farsighted. It occurs when light rays are focused behind the retina, causing near images to appear blurry. Near-objects appear blurry because the light rays are spread apart instead of focused when they strike the retina. 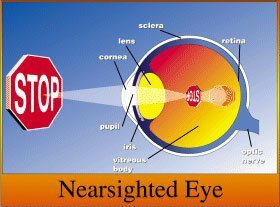 Very far-sighted people have difficulty seeing clearly the distant objects as well. Hyperopia is the result of an eyeball which is too short or a cornea which is less curved. This creates blurred vision that is more noticeable for near objects than distant ones.Hyperopia is not a disease, nor does it mean that you have “bad eyes.” It simply means that you have a variation in the shape of your eyeball. Hyperopia may be present in childhood but does not usually become apparent until people are in their late 20’s or 30’s when they can no longer see up close. 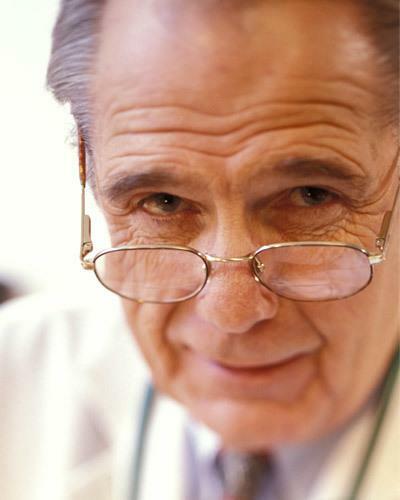 When these patients get into their 40’s or 50’s, they begin to have difficulty seeing distant objects as well. Corrective convex lenses (“positive” lenses that are thicker in the center than at the edge) or contact lenses are prescribed to focus light more precisely on the retina, where a clear image is formed. Astigmatism is an overall inability of the eye to focus clearly at any distance. It occurs when the cornea is shaped more like a football (with two different curvatures) than a well-rounded baseball. Images appear blurred or ghost-like because light rays are refracted unequally. In extreme cases, images both near and far, appear blurred. Many people who have myopia also have some degree of astigmatism. This creates eye strain. Many people live with minor astigmatisms that do not require any type of treatment. Others with more severe astigmatism can have it corrected by wearing glasses or contact lenses. Presbyopia is the inability to focus the eyes at near. In young individuals, the natural lens of the eye is soft and pliable. This innate flexibility permits the natural lens to change its shape, allowing it to focus on objects near the eye. As the years’ pass, the lens loses its flexibility and can no longer vary the focus of the eye. This condition usually becomes noticeable sometime between 40 and 50 years of age. People with myopia as well as hyperopia have presbyopia after age 40.